Rhyl Folk and Acoustic – NO CLUB 3rd August, BUT THERE IS AN ALTERNATIVE!!! 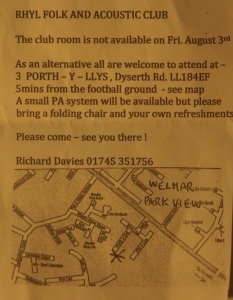 NO CLUB 3rd August, BUT THERE IS AN ALTERNATIVE!!! SORRY ABOUT THE LATE NOTICE,(AGAIN!! BUT ITS NOT OUR FAULT!!) BUT WE HAVE ONLY JUST FOUND OUT THAT REGRETTABLY WE WILL HAVE TO CANCEL THE CLUB NEXT FRIDAY 3rd AUGUST, DUE TO A FOOTBALL FIXTURE, WOULD ALL MEMBERS WHO RECEIVE THIS MESSAGE PLEASE CONTACT AND TELL AS MANY PEOPLE AS POSSIBLE, AS NOT ALL OF US ARE ON THE CLUB DATA BASE, OR FACEBOOK!!! WE DON,T WANT PEOPLE TURNING UP TO FIND ITS NOT ON. THANK YOU RICHARD, SEE YOU ALL THERE.